Waterbury, in New Haven County, is located in west-central Connecticut on the Naugatuck River. It was settled in 1674 as a part of Farmington (in what is now known as the Town Plot area), and was originally called Mattituck Plantation. Incorporated as a town in 1686 and a city in 1853, Waterbury is named for its abundant waterways. 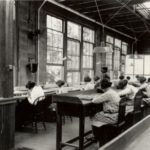 Nicknamed the Brass City, and once the center of the American brass industry, manufacturing declined after World War II from employing a peak of 50,000 brass workers to less than 5,000 by the 1980s. Connecticut’s fifth-largest city, Waterbury is home to the Mattatuck Museum. “Genealogy & Local History.” Silas Bronson Library, 2017. Link. “Rosalind Russell.” Connecticut Women’s Hall of Fame, 2017. Link. “Hopkins Street Center.” Connecticut Freedom Trail, 2017. Link. “American Brass Company Records.” Thomas J. Dodd Research Center, University of Connecticut Libraries, 2016. Link. Illustrated Catalogue Waterbury Button Co.: Military and All Metal Buttons: Army, Navy, Police, Fire Department, School and Livery. Waterbury, CT: Waterbury Button Company, 1900. Link. “Map of the City of Waterbury, New Haven County, State of Connecticut.” Cadastral map. Boston, MA: Walker Lith. & Pub. Co., 1909. Connecticut Historical Society. Link. Bailey, O.H. “Map: View of Waterbury, Conn. 1899.” Bird’s-eye. New York: Landis and Hughes, 1899. University of Connecticut Libraries, Map and Geographic Information Center - MAGIC. Link. Fowler, T. M. (Thaddeus Mortimer). “Map: View of Waterbury, Conn. 1917.” Bird’s-eye. New York: Bailey, 1917. University of Connecticut Libraries, Map and Geographic Information Center - MAGIC. Link. McGill, George W. “Object- Mcgill’s / Patent / Fasteners / Etc., Etc. / for Sale Here / Also Card and Calendar Suspending Devices.” Smithsonian Institution, National Museum of American History, 2016. Link. Middlebrook, William D. Patent Number 636,272 - Machine For Making Wire Paper-Clips. 636,272. Waterbury, CT, issued November 7, 1899. Link. Reynolds, Edith, and John Murray. A Brief History of Waterbury. Charleston, SC: History Press, 2009. Brecher, Jeremy, Jerry Lombardi, Jan Stackhouse, and Brass Workers History Project. Brass Valley: The Story of Working People’s Lives and Struggles in an American Industrial Region. Philadelphia, PA: Temple University Press, 1982. Anderson, Joseph, ed. 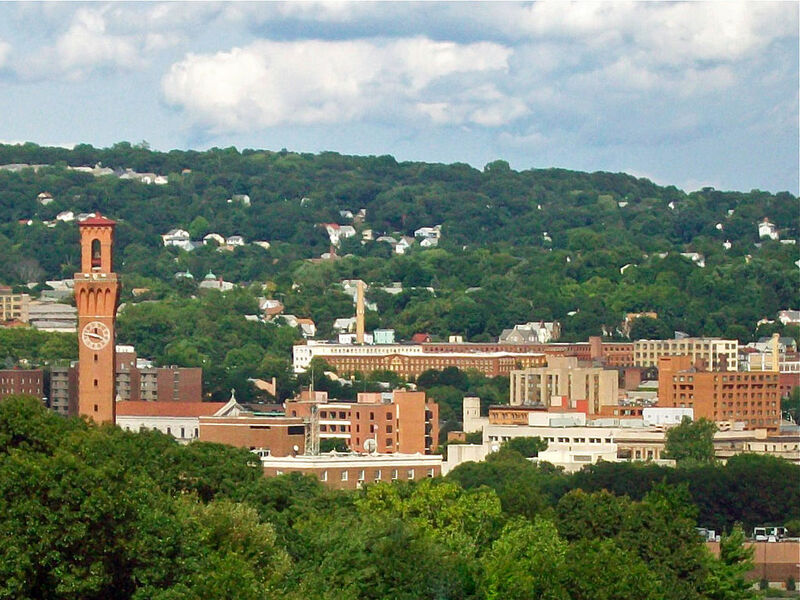 The Town and City of Waterbury, Connecticut. Vol. 1. New Haven, CT: Price and Lee Company, 1896. Link. Chesson, Frederick. Waterbury. Dover, NH: Arcadia, 1996. Bassett, Homer F. Waterbury and Her Industries. Fifty Attractive and Carefully Selected Views, by the Photogravure Process, as Photographed from Nature, of the Many Leading Manufacturing Establishments, Public Buildings, Churches, Residences, Park, Street and General Bird’s-Eye Views of Waterbury, Conn., Together with a Historical Sketch of the City and Its Various Industries. Gardner, MA: Lithotype Printing and Publishing Company, 1889. Link. Wiehn, John. Waterbury Irish: From the Emerald Isle to the Brass City. Charleston, SC: The History Press, 2015. Mattatuck Historical Society, and Cornelius Maloney. Waterbury, 1674-1974: A Pictorial History. Chester, CT: Pequot Press, 1974. Wiehn, John. Waterbury: 1890-1930. Charleston, SC: Arcadia, 2003. Reynolds, Edith. Wicked Waterbury: Madmen & Mayhem in the Brass City. Charleston, SC: History Press, 2009.